GA Tickets available at NOW Otherside Tattoo (561 Gladstone Ave.), and The ODDs & SODs Shoppe (1527 Merivale Road). 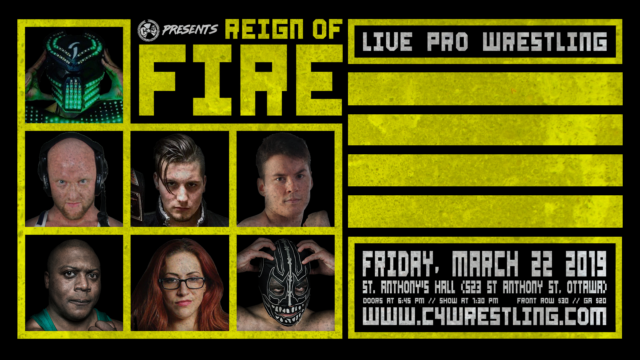 #C4ReignOfFire – Massive Six Man Tag headlines March 22 event! A massive debut and a return! In just over a month, we return to action as we present #C4ReignOfFire. Right now we are excited to announce a massive Main Event, featuring the return of a beloved former C*4 Champion, and the debut of an independent standout! Last month, TDT went to war with the debuting Butcher and The Blade. Doors and chairs a plenty were used – and a shocking upset saw Andy Williams and Pepper Parks standing over Mathieu St. Jacques and Thomas Dubois, in victory. TDT wants another shot. They’ve brought back-up. Butcher and The Blade have agreed, and they’ve recruited a partner. Get ready for this one! #C4ReignOfFire – Former UFC fighter debuts! In under a month, we return to action with an absolutely stacked show as we present #C4ReignOfFire! We’ve already announced a major Six-Man Tag main event, featuring the debut of Darby Allin, and the return of Buxx Belmar. Well, now we’ve got an exciting debut of a talent looking to make a major impact on C*4. 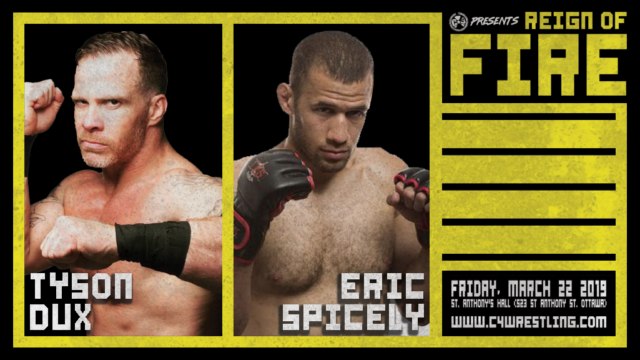 On March 24th, we welcome the debut of former UFC and active MMA competitor, Eric Spicely. Spicely, while best known for his MMA career, is also well versed in professional wrestling, having trained under former C*4 talent Biff Busick (NXT’s Oney Lorcan), and competing in a WWE try-out camp in late 2018. Spicely, upon coming to terms with C*4, requested a match against none other than Tyson Dux. Dux simply smiled, and accepted the “challenge”.. He has assured C*4 he is excited to welcome Spicely to the promotion. #C4ReignOfFire – Three-Way Madness! “Speedball” returns, DJZ debuts, and Matt Angel returns to the hunt! Last month, the entire C*4 fan base watched in surprise as Matt Angel’s Championship reign came to an abrupt conclusion at the hands of “The Walking Weapon” Josh Alexander, following an incredible contest. Perhaps no one was in anymore shock than Matt Angel, as his short reign came to an end. Was he not ready? Was his experience just not up to that of Josh Alexander? Did he underestimate what Alexander was going to bring to the table on January 25th? Where does Angel go from here? On March 22nd, Matt Angel will step into a match featuring two world-class opponents, as he continues to challenge himself. We are thrilled to announce the C*4 debut of DJZ. For the last 15 years, DJZ has travelled the world, including a long stint in Impact Wrestling, and former two-time X-Division Champion. DJZ vs. Matt Angel could headline any show, anywhere, with those two alone… But we’re not finished. 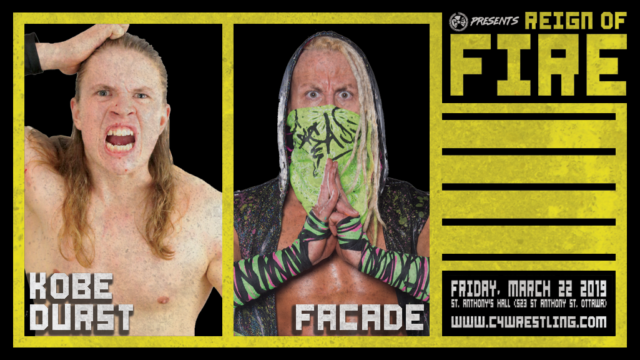 Coming back to Ottawa, is a C*4 original, and current international superstar… One of the top independent talents in the world today, “Speedball” Mike Bailey! Bailey, always ready for a challenge, will join the fray at #C4ReignOfFire, making this an insane Three-Way Dance! Don’t blink, and don’t miss a moment of this match! #C4ReignOfFire – News update! Congratulations Josh Alexander! Underground Championship match set! Before we get into this update concerning another exciting Championship match signed for #C4ReignOfFire – we have some news we wanted to address. Last month, Josh Alexander scored a major victory, as he won the C*4 Championship from Matt Angel. After the win, many questioned what was next for him on March 22nd. Following his win, Josh achieved another very important milestone in his career, as he signed with IMPACT Wrestling. All of us couldn’t be happier for Josh. For a decade Josh has performed in C*4, he’s won championships, stolen shows, and we have watched him grow into truly one of the top performers in the country. We are excited for him as he takes the next steps in his career and become one of the best performers in the world. As a result of the signing, Josh will no longer be able to appear on March 22nd, as it will conflict with an IMPACT taping date. HOWEVER, Josh Alexander, and the C*4 Championship will be back on April 26th, when he returns to Ottawa! 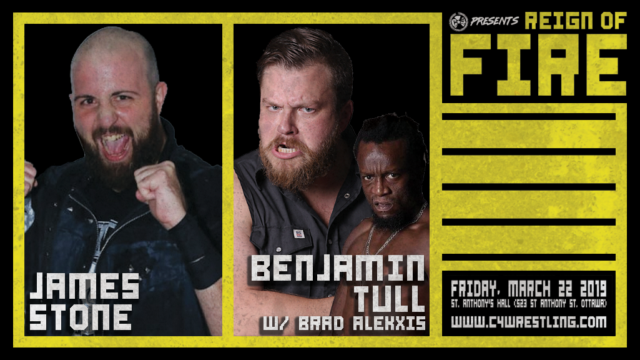 Speaking of Championships… In January, Jonathan Rukin won the C*4 Underground Championship in an impromptu match-up, ending Benjamin Tull’s near year-long reign as Champion. With the title now firmly in his grasp, Rukin told management he would defend against any challengers who wanted a shot. On March 22nd, he gets his wish. #C4ReignOfFire – Diamond Tiger collides with the returning Neon Ninja! We’re two weeks away from our next big event, and right now we have another exciting match to announce. 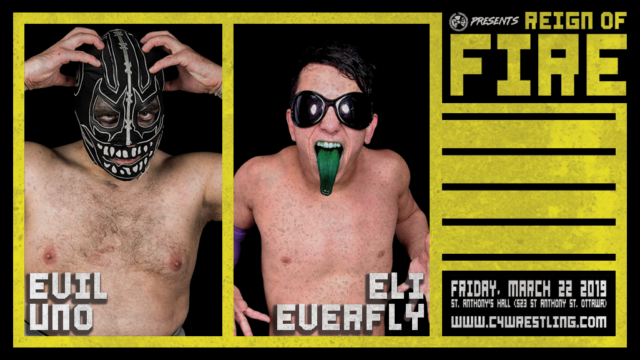 A match featuring a former C*4 Champion, and an exciting high-flying fan favourite making his return! Kobe Durst is known for his risk-taking, but the “Neon Ninja” will gladly meet him in for a dog fight in the air throughout St. Anthony’s Hall! Get your tickets NOW and be there on March 22nd! #C4ReignOfFire – Tag Team Championship madness! 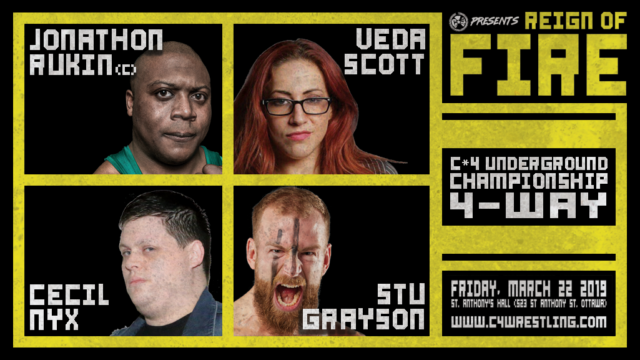 We’re just over a week away from #C4ReignOfFire, and we’ve got another Championship match to announce! “MVP” Michael Von Payton and Sheldon Jean, are pair of unlikely champions – however, the duo managed to take the Championships off of Fight or Flight earlier this season, in an impromptu handicapped match. The duo once again retained (albeit not without controversy) those Championships in January. Well, on March 22nd, Von Payton and Jean will have their hands full as they defend the Championships against three teams! Three unique challenging teams… One team, the former Champions… Another, two young men looking to do whatever it takes to make it to the top… And two familiar faces debuting as a team in C*4 for the first time. 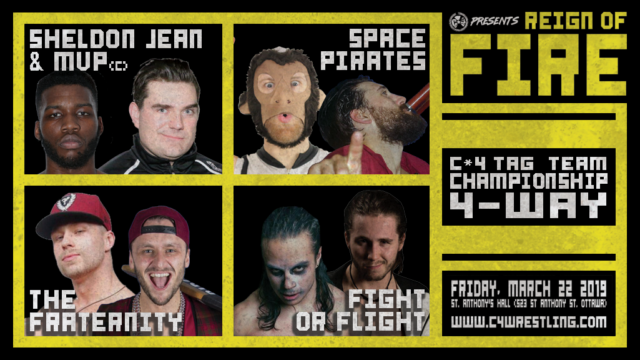 #C4ReignOfFire – Full card for this Friday night! Two big singles matches signed! It’s almost here! #C4ReignOfFire is just days away – and we have two final matches signed to round out the card! First up a battle of a C*4 original - and more importantly - undefeated this season talent – and a young man coming off a huge win in C*4. For the first time ever, Uno meets Eli! Finally, rounding out a card, a the former Underground Champion attempts to regain his footing and prove the lose to Jonathan Rukin last month was a fluke. His opponent, is looking to prove himself in this big singles encounter. There you go! A STACKED show. Eight massive matches. Advance tickets will remain on sale until Friday afternoon!